Dealer Bill Krouse doesn't want you to miss the point: No bargaining. Period. MINNEAPOLIS -- After more than 15 years selling cars, Bill Krouse was bothered in 1992 that the most demanding customers usually got the best deals. Customers who were nicer -- and often more loyal -- paid more. "It just didn't seem fair," said Krouse, then the general manager at Polar Chevrolet-Mazda in the Twin Cities suburb of White Bear Lake, Minn. The dealership sales culture was all about separating customers from their cash, not building repeat business. As a Cub Scout leader who was teaching his 7-year-old son the Cub Scout promise that year, Krouse re-examined his own life and values. "There was no award to trip a little old lady with a cane carrying a bag of groceries," he said. It set Krouse, now 61, looking for a better way. He said he found it in the one-price, no-haggle sales model just starting to pick up steam in the industry in the early 1990s. With the blessing of majority owner Thane Hawkins, Polar converted to one-price on Sept. 28, 1992; it was one of the first stores in the Twin Cities market to do so. "It was a turning point for the dealership and for the marketplace," said Krouse, now vice president and part owner of Polar, where the parking lot and showroom are dotted with "no haggle" and "no hassle" signs. A dad's Cub Scout-inspired epiphany helped trigger a transformation of the Twin Cities market. Eighteen years later, helped along by consumers' increasing access to pricing data, as many as half the dealerships in the Minneapolis-St. Paul area operate under a one-price or limited-negotiation value-pricing model, according to estimates by local dealers and other industry representatives. Call it "Minnesota nice" meets the Internet. The three largest dealership groups in the market -- Luther, Morrie's and Walser -- are on board. While adhering to the model is hard work, business is going well, better than if they had stuck with traditional negotiations, some say. John Buelow, a retail consultant at Wipfli LLP in the Twin Cities suburb of Edina, with customers across the country, doesn't know of another major market with such a high concentration of one-price and value-price stores. "We have maybe reached a little bit of a tipping point," Buelow said. "When you have a high concentration of dealers that control that many points, then it becomes pretty pervasive pretty quickly, especially if they're trying to keep up with each other." In addition to Polar, Wes Rydell stores in the area were instrumental in influencing the market, Buelow said. Rydell's Apple Valley Ford has been one-price for years. Tousley Ford, now an AutoNation store, went to one-price in late 1992 and later evolved to value pricing. But the approach began to build steam with the conversion of Walser Automotive Group in 2002. "It really took root when the Walser group did it," said Scott Lambert, executive vice president of the Minnesota Automobile Dealers Association and the Greater Metropolitan Automobile Dealers Association. For Paul Walser, CEO of Walser Automotive Group, it was his second run at one-price. He first tried it at a Lincoln-Mercury store in 1989. It didn't last. "The one-price model needs volume," said Walser, 55. "And, frankly, I just didn't have the stomach for what it would take to stay the journey." In the 1990s, he watched from the sidelines to see how the initiative worked at Polar and elsewhere. By 2002, Walser was ready to try again. At that point, with his father in semi-retirement, he was leading the Walser group. It was an expensive transition. Walser lost a lot of good salespeople. Profits slid, and some stores posted losses. Walser said he expected the first year to be awful -- and it was. He spent heavily to advertise "the Walser Way." Profits improved in year two; by year three, results had just about rebounded to pre-conversion levels. Today repeat and referral business has easily doubled, Walser said. And the group's 11 stores, largely selling volume import brands, are now putting up better numbers on profits, volume and customer satisfaction than they ever would have without the switch. Walser expects to sell close to 20,000 new and used vehicles in 2010. Word got out a few years ago that CarMax was looking to acquire property in the Twin Cities area, Buelow said. The megaretailer already operated a no-haggle model, and the specter of CarMax had a lot of the big groups saying "we need to get our ducks in a row," the consultant said. The CarMax stores haven't materialized, but the biggest groups in town are ready. Former megadealer Denny Hecker, who once had 15 dealerships in the market, never operated one-price or value-price stores, competitors said. But the two other dealership groups, Morrie's and Luther, made the switch. Morrie's Automotive Group is the most recent convert, going to one-price at its 12 domestic and import brand stores in the fall of 2008. Morrie's sold 10,500 vehicles in 2009, split about evenly between new and used. Unit sales are up 40 percent through first-half 2010. "We agonized over this for a long time," said CEO Morrie Wagener, who wanted a common experience for customers regardless of which store they visited. "You have to do your homework, but there's a lot less brain damage doing it this way." He closely watched the experiences at Polar, the Rydell stores and the Walser stores before making the plunge. It has been hard work, and turnover has been higher than he hoped. But he calls the new model successful so far. Productivity of floor managers is up. There's no more sitting in the dealership until midnight arguing with a customer about $100, said Wagener, 72, a lifelong Minnesotan who got his start as a service technician in 1959. He declined to share before-and-after profitability figures. Wagener said his goal was to find a business model that prepares the dealership group for the changes being demanded by younger customers who are short on time, are savvy about pricing and hate to haggle. Luther Automotive Group, the area's largest retailer with 25 stores and 26 brands, began switching to value pricing about four years ago. About 20 of Luther's stores are in the Twin Cities market. President David Luther said he has taken the conversion slowly because he wants each store to have the proper training. He expects to complete the transition at all stores by year end. Business has improved, which Luther credits both to the new pricing approach and dealership upgrades and other improvements. He declined to share details. But he made the change to meet customer expectations, not improve competitiveness, said Luther, 53, who took over the family business from his father in the mid-1990s and expanded it. One-price and value-price operators in Minnesota generally agree on the basics of making the philosophy work. You have to come up with a sales price that reflects what people are paying in the market. Dealers watch competitor ads and Web sites and use third-party vendors that track transaction prices. Prices must be adjusted often to keep them in range with the rest of the market. Walser tries to stay within about $400 of the lowest price in the market on similar models. Wagener of Morrie's Automotive said: "We're never going to be the lowest in town, but if we're not between the fenceposts on pricing, you're not going to be in the deal." Wagener has his stores mystery-shopped constantly to ensure that staffers are sticking to the no-haggle mandate. Sharing how pricing is determined, along with the third-party benchmark data, builds trust with customers, the dealers said. One-price operators say they won't budge on the price of the vehicle during a transaction. But they may trim the sales price, sometimes weekly or even more frequently, as the vehicle ages or if they discover they're higher than the market. Krouse and other dealers say they constantly check prices at other area dealerships and use Internet-based used-pricing tools to gauge the real-world value of potential trades in their market. Then they offer the customer what they say is a fair price. Strict one-price operators say they won't budge from that offer. Value-price operators handle pricing similarly. During a transaction, they may wiggle a little or throw in something extra to secure the deal, but they try not to. To make the pricing stick, they separate the pay of the sales force from the vehicle sales price. Instead of commissions, value-price operators typically pay a salary and bonuses based on volume and customer satisfaction. For one-price stores, staying pure is a must, Krouse said, or the system will collapse. 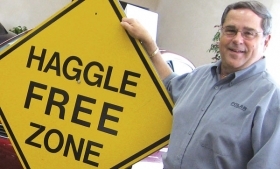 That means no haggling on trade-ins or finance and insurance products. He won't let his sales staff budge a dollar on a deal, even if that means letting the customer walk out the door. Several dealership groups and individual stores have made the Twin Cities market a haven for the one-price and limited-negotiation value-pricing models. Why has limiting negotiations seemed to work so well in Minnesota? Locals claim that culture plays a role. "There is a lot to 'Minnesota nice,'" Krouse said. "I think people genuinely do look out for their neighbors more." Tapping into that spirit with his Cub Scout-inspired conversion has worked out well for Polar Chevrolet-Mazda. Productivity has soared. Krouse anticipates sales of $80 million and 3,800 new and used vehicles this year. Including fleet and commercial units, Polar is the largest Chevy dealer in Minnesota, Krouse said. Everyday low prices line up with the way Midwesterners think, Walser said. "This is a community of real decent folks, and I think one-price is a real decent way of doing business," he said. But changing forces in the industry also make the one-price or limited-negotiation model more popular. "Our guests today are very sophisticated, especially in our community," Luther said. "They're a fairly well-educated population. They do a lot of research. It doesn't take a rocket scientist to find out what a flat-screen TV or an automobile is selling for, so why make it rocket science?" The area's high concentration of family-owned groups also has sped the conversion, the dealer association's Lambert said. "It takes a large force of personality to turn your organization into it," he said. "It's just easier for stores where the owners are close to them and have some market power to be able to do it." Not all customers embrace the approach. "The people in my experience who hate one-price are old-school ranchers, small-town people," consultant Buelow said. But with the growth of Internet shopping and ever-tighter margins from the manufacturers, the Twin Cities market may prove to be a preview of where most big markets are headed. Already, many of the big public dealership groups are talking about or making a transition to a value-pricing model. "The Internet is kind of forcing it," Walser said. "Eventually, I don't see how anyone can avoid it."